Media captionWhy is it difficult to know exactly how many people sleep rough? Deaths of homeless people were nine times higher in deprived areas of England than in the least disadvantaged areas, analysis of data has shown. There were an estimated 21 deaths in Manchester, 18 in Birmingham, 17 each in Bristol, Lambeth and Liverpool and 15 in Camden in 2017. About 2,627 homeless people died in England and Wales from 2013 to 2017. Deaths were recorded in 156 local authority areas in 2017, the Office for National Statistics (ONS) said. When weighted by population, the 11 deaths estimated in Blackburn with Darwen gave the area the highest rate. Housing charity Shelter said the figures were a "wake-up call". Chief executive Polly Neate said: "There is nothing inevitable about people dying homeless, it is a direct consequence of a broken housing system." Jon Sparkes, chief executive of Crisis, said councils needed "appropriate funding to conduct reviews into the death of every person who has died while homeless, to prevent more people from dying needlessly". The breakdown followed the release of figures for England and Wales in December, with an estimate of 574 homeless deaths in urban areas in 2017, compared with 26 in rural areas. Analysis of confirmed deaths in England over five years showed almost a quarter were in the 10% of areas officially ranked as the most deprived. The ONS said: "The rate of deaths per 100,000 population in the most deprived tenth of local areas in England was 9.2 times that of the least deprived tenth. "For Wales, the rate of deaths per 100,000 population in the most deprived tenth of local areas was 3.4 times that of the least deprived tenth." 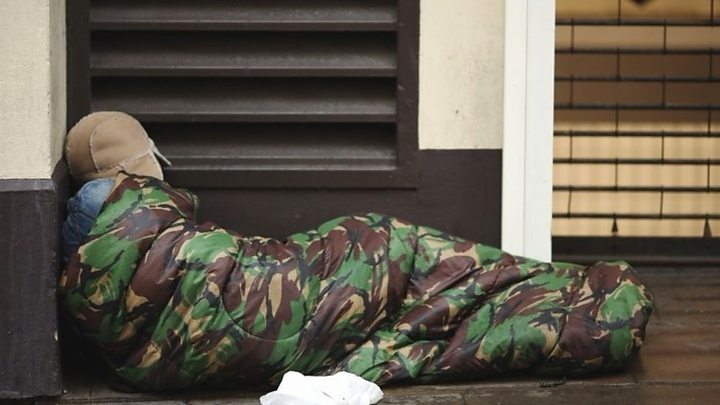 The ONS included people sleeping rough or using emergency accommodation, such as homeless shelters and hostels, at or around the time of death. Reality Check: Who is homeless? Ben Humberstone, head of health analysis for the ONS, said: "The figures show that the deprivation level of an area has a real impact. Many more people die homeless in the most deprived areas of England and Wales and 95% of the deaths are in urban areas rather than rural areas." Sayyed Osman, Blackburn with Darwen Council's director of adults and prevention, said: "The issues here are complex and made worse by the fact we have a disproportionate amount of hostels which people from out of our borough are coming to use which in turn puts further pressure on limited resource and services. "These are major issues affecting towns and cities across the country and there are no quick or easy solutions and this is certainly not something that the council can deal with in isolation." The number of people counted or estimated to be sleeping rough in England fell slightly in 2018 for the first time in eight years. The government said it was investing £1.2bn to tackle homelessness. Communities secretary James Brokenshire said: "Councils have used this funding to create an additional 1,750 beds and 500 rough sleeping support staff - and figures published last month show this investment is already starting to have an effect. "I am also committed to ensuring independent reviews into the deaths of rough sleepers are conducted, where appropriate, so that important lessons are learned - and I will be holding local authorities to account in doing just that."